For those prone to flights of fantasy, Whimsical Garden Gates at Heritage Museums & Gardens will thrill and delight. 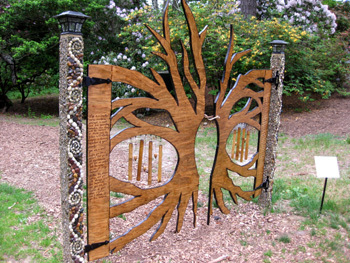 Heritage invited artists from the region to create a whimsical, but functioning, garden gate to be part of this 2012 Season exhibit. 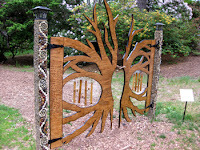 The gates were created by 16 such artists and are displayed along the pathways throughout the grounds of the botanical gardens. Charlie and I just spent a much needed, relaxing afternoon at Heritage enjoying strolling through the gardens in search of these gate installations. We always enjoy our time at Heritage but, as an artist and someone who likes to garden, this visit was really special. We went there for the express purpose of searching out the locations of the gates in this new exhibit. At the ticket booth, we received a map denoting where they are located and then off we went as excited as children on an Easter egg hunt. 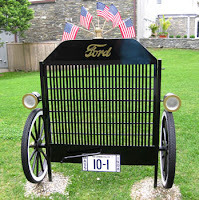 One of the first garden gates you encounter could not be in a more appropriate place than on the lawn at the Automobile Museum. It is entitled Gateway to the American Roadway and was a collaboration between Janet Davis and Mark Zanghi. 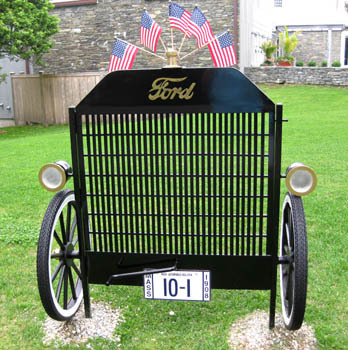 They were inspired by the Ford Model-T and the man who changed the way America traveled. A little farther down the pathway and located near the windmill, you will find artist Will Clarke’s gate entitled And the Seasons They Go Round and Round. This piece is meant to remind us of the seasons of gardening in New England and of our rural past and “revolving” present. When you visit this installation, you will see what I mean. 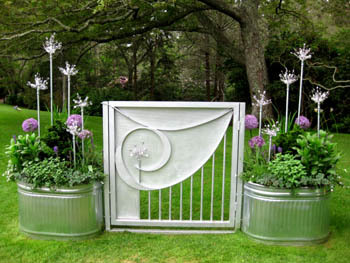 Other garden gate installations are nestled amongst the trees and flowers along trails and in gardens, both enhancing and enhanced by their setting. 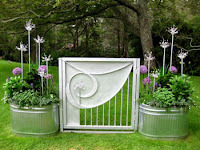 Fitting perfectly into the landscape is the garden gate entitled Transformative Passage of Earthly Balance. The product of artist, teacher, and Reiki Practitioner Tessa D’Agostino, this lovely piece reminds us how dependant we are on the earth and nature, and of all that we derive from their constancy. She encourages you to take time from your busy world to find you reflective self. Be sure to read the inscription that is carved into the left side of the gate. Elisa Sullivan and Grace Archambeault created the very beautiful And the Tree Was Happy, representing their love and appreciation of nature. For her gate, Susan Beardsley re-purposed objects that are no longer useful for their original purpose into something both useful and beautiful and titled What’s a Garden without Bugs? The addition of the bug is to prompt a smile from gardeners as they pull weeds from their garden. 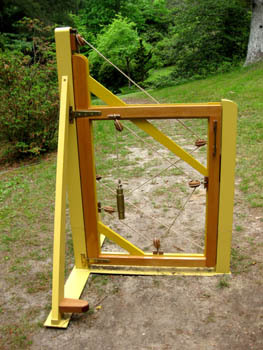 A really interesting and quite different piece is the garden gate designed by Christopher Lenaerts and Rosalyn Driscoll called Forces in Play. It is beautifully constructed of traditional boat-building materials and draws on the elements of sailboat rigging to create a complex but playful gate. This is one that we just had to swing open. I hope the folks at Heritage don’t mind, but we just couldn’t resist. One of my personal favorites is a collaborative work by Angela Rose and Lauren Miklavic entitled Welcome to Our World. This really fabulous piece is a collaboration between an artist and a gardener that beautifully represents the co-existence of art and nature in the garden. It is on display just outside the museum housing the Norman Rockwell exhibit. I could see this wonderful piece in our gardens here at our bed and breakfast inn. Part of the fun of this exhibit is reading about the artist’s inspiration for their piece that is written on plaques at each installation. It gives you insight into their process as each developed their piece. These are just a few of the gates which we saw. Others on exhibit are Kenneth Speiser Bubble, Alfred Glover’s Garden Gate ( at the entrance of the gardens), Donna Mahan and Kathy Williams gate entitled Whimsical Interplay, Bonnie Maresh’s Forever Flowers, Lee Sullivan’s Findings, Leslie Wilcox’s Winsome Gate, JC Stahl,s Ribbon, Sally Fine’s Pond Gate, and Joel Reider’s Centrifugal Forest. 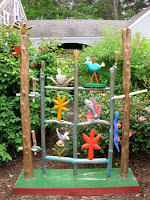 Why not come stay with us and visit Heritage Museums & Gardens and have an adventure discovering these Whimsical Wonders. 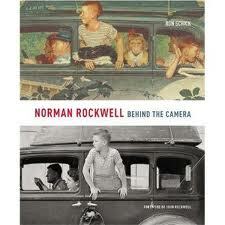 What can one say about Norman Rockwell that hasn’t already been said? Ask the folks at Heritage Museums & Gardens. 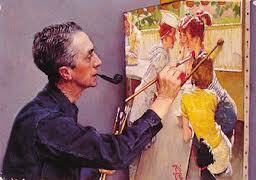 This summer, they are presenting Norman Rockwell: Beyond the Easel. The exhibit is a study of Rockwell's process. This exhibit lets you explore the process this iconic American illustrator used to produce his art. As you view over 150 pieces of his work, you will learn how he used his real-live acquaintances as models, staged the “set”, shot the photographs, and how these evolved into paintings. One is left to wonder if he wasn’t in many ways an early performance artist. After the photographs were taken, Rockwell would use them as a guide in creating very detailed drawings of his subjects. In some of his original works, you can detect the pencil lines under the surface of the paint. Next he would create a wash (paints that have been thinned with oil or turpentine) using all of the values that he intended for the final painting. Then, he would lay in thin layers of color over the wash until he achieved the intensity he desired. Norman Rockwell painted for the masses. He once said, “I don’t want to paint for the few who can see a canvas in a museum, for I believe that in a democracy, art belongs to the people. I want my pictures to be published”. And published they were, in Leslie’s, The Country Gentleman, Judge, and most famously, The Saturday Evening Post to name a few. He sold his first piece of cover art to The Saturday Evening Post at the age of 22. Rockwell did illustrations for novels, short stories, and articles, which were often quite different in style and overshadowed by his Post covers. He could take an ordinary occurrence and make it appear extraordinary but with a humorous quality that induced a collective chuckle from readers. Even so, critics were not often kind in their assessment of his work. 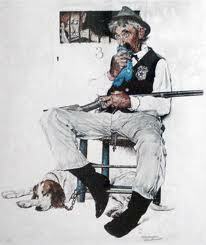 Norman Rockwell served in the armed forces, remaining state-side during his service. He loudly proclaimed his patriotism through his art as evidenced in such famous series as the Willie Gillis series, Rosie the Riveter, and the Four Freedoms, which contributed to the success of war bond sales during World War II. The Four Freedoms is perhaps the most famous of these series, the theme representing, and bearing the titles of, the four essential human rights of “Freedom of Speech”, “Freedom of Worship”,” Freedom from Want”, and “Freedom from Fear.” The impetus for these paintings came from a 1941 State of the Union speech made by then President, Franklin Roosevelt. As an added treat, featured in the Auto Museum at Heritage will be some of Rockwell’s images that include automobiles. These automobiles are actually included in the exhibit. One is a 1951 Ford Country Squire as seen in his illustration entitled “Closing up for the Summer”. As in all of his pieces, these exemplify his meticulous attention to detail to enable the realistic painting style that he embraced. For 46 years Rockwell drew from current events to produced art to grace the cover of The Saturday Evening Post that exhibited humor, patriotism, and in some instances courage, while providing us with a view of ourselves. Through this pictorial legacy, Norman Rockwell has made an immeasurable contribution to American art. An art major in college in the late 1960's, and a lover of realism, I have always loved Norman Rockwell. For our first anniversary, my husband gave me a hand signed, artists' proof, collotype of Rockwell's entitled "Music Hath Charms" which was a Post cover on November 4th, 1939. I have also had for many years a lithograph entitled "Convention" that was a Post cover on May 3rd, 1941. It is also an artist's proof that was signed by Mr. Rockwell himself. I love them both but "Music Hath Charms" remains one of my most loved possessions. They are both proudly displayed in our bed and breakfast. Many of the guests who have stayed at our inn this spring have taken the opportunity to visit this amazing exhibit and have come away loving Norman. We hope you will too. There is a week for just about everything and American Craft Beer Week is May 12th through May 19th, 2012. Many businesses here on Cape Cod will be participating. Whether you are a beer aficionado or not, this is a fun time to try many varieties of beers. Local brewmeisters are showing off their brews, restaurants are promoting beer and food pairings, and liquor stores are having tastings and selling some great craft beers. Craft beer brewmeisters strive for individual character in terms of color, taste, and body. They look for the best quality ingredients in the hope of producing unique and highly desirable brews. 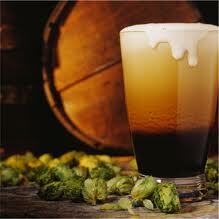 The brewing of craft beers is a growing and increasingly popular segment of the industry. According to the Brewers Association’s statistics, the majority of breweries in the US are now craft breweries. For those who would like more information about craft beers and the brewing of them, there is a great website you might enjoy. Brewers of craft beers have come of age, making this a great time for folks who just love beer and for those just developing an interest in the growing varieties of craft beer available. Craft beer brewers and distributors are now using tastings to educate the populous about food pairings much the same way the wine industry has done for years. The Boston Beer Company, brewers of Samuel Adams, will be holding tastings, promotions, and dinners at Sam Diego’s in Hyannis, the BBC in Hyannis, and Captain Parker’s in West Yarmouth. They will also be presenting a 5-course dinner at the Chatham Bars Inn on Thursday, May 17th. For information about the dinner, call 508-945-0096. 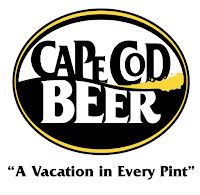 Cisco brewers from Nantucket will be holding tastings at the Cape Cod Package Store in Centerville. They will be doing promotions at Not Your Average Joe’s and at the Beech Tree Cantina in Hyannis, and will be featured at a beer dinner at the Naked Oyster in Hyannis. Guinness will be promoting their beer at Liam Maguire’s in Falmouth, at the Chatham Squire in Chatham, O’Shea’s Olde Inn in West Dennis, and Tommy Doyle’s in Hyannis. While you are in Hyannis, stop by for a tour and taste at the Cape Cod Beer Company and pick up a growler to enjoy later. The brewery will be participating in Beer Week with Cask Night at Flynn’s Irish Pub in Bourne on May 16th and tastings at the Cape Cod Package Store in Centerville and Yarmouth Wine & Spirits in South Yarmouth. Their full schedule is available on their website. 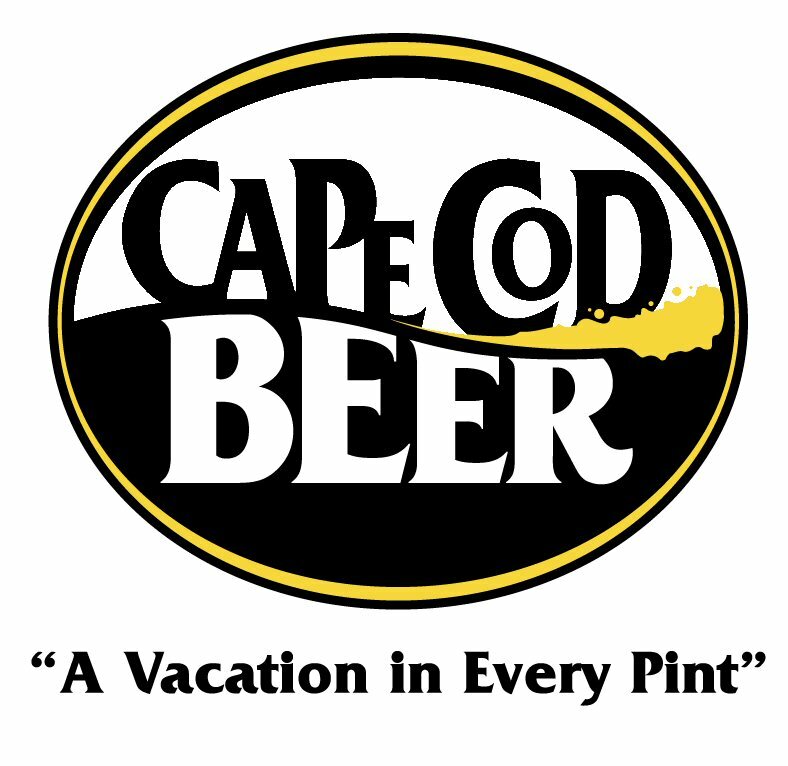 After all, Cape Cod Beer is a Vacation in every pint. On Saturday, May 19th, make you way to Provincetown for the Craft Crawl. Participating establishments are the Squealing Pig, Governor Bradford, Surf Club, George’s, Underground, Nor East, Waydowntown, Crown & Anchor, and Bubala’s. When you attend events and tastings during beer week – and any other time for that matter – keep in mind that brewers display passion and creativity using complex ingredients to produce pure happiness in a glass. So, respect the artistry; craft beers are to be savored and not swilled. Cape Cod says, Hello, Dolly! Cape Cod has its doll collectors the same as most places in the free world. This very popular category of collecting has spawned doll clubs and organizations throughout the country, from folks who collect dolls for their value to folks who just love dolls. What little girl doesn’t look forward to birthdays and Christmas when the gift might be that coveted doll she has been dreaming about. I know when I was a very young child in the early 1950’s, I dreamed about receiving a Bride Doll, which was the popular obsession of the day. 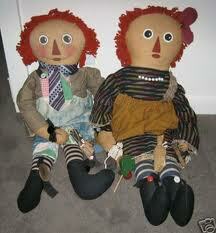 Of course, back then, we didn’t have the endless variety of dolls that are available today. 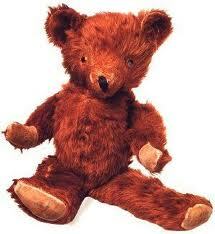 For anyone who loves dolls, there is infinite information available online to help you learn about doll collecting. There is information about buying dolls, books and magazines about dolls, doll events, which dolls to collect, clubs and organizations to join where you will meet other doll collectors and enthusiasts, costumes for dolls, how to restore dolls, how to sell antique dolls, and there is even a website with a doll collecting glossary. For a number of years there was a doll museum here in Sandwich, in a repurposed church just around the corner from our bed and breakfast. That church has been renovated and is now a private residence. 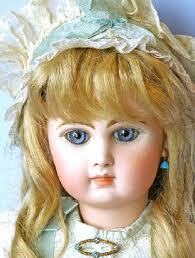 Doll collectors and enthusiasts have found other locations to gather however. On June 10, 2012, Yesteryears Doll Study Club will hold an Antiques, Collectibles, & Accessories Show at the American Legion Hall at 20 Main Street (Route 130) here in Sandwich. The show is from 10:00 am until 3:00 pm and the admission is just $3.00. For more information, contact Cynthia Burke at 508-697-5781 or email Jennifer Sweeney at Jaide73@hotmail.com. Do you ever outgrow this doll obsession? For some, the answer is a resounding, ‘No!’ Come join other doll and toy collectors and enthusiasts on June 10th here in Sandwich. Make a weekend of it and stay with us at our historic bed and breakfast. We will serve you a fabulous breakfast before you head off to the show.